Egypt's newly inaugurated president, Abdel-Fattah El-Sisi, held talks in Cairo on Wednesday with senior British government officials in which they highlighted the mounting danger of terrorism in Egypt and the region, state news agency MENA reported. El-Sisi met with Kim Drock, the British National Security Advisor, who congratulated him on his victory in last month's election and gave him a letter from Prime Minister David Cameron, said presidential spokesperson Ihab Badawy. Barrock affirmed his country was aware of the formidable challenges Egypt faces to revive its battered economy and fight a mounting Islamist militancy, Badawy said. He said the UK was looking forward to bolstering its strategic partnership with Egypt to confront growing terrorism in the region, namely in war-torn Syria and Iraq -- which has been riven by sectarian fighting and a rapid military advance by radical Islamist groups. El-Sisi was sworn-in as president on Sunday after he pulled off an overwhelming victory in last month's election, almost a year after he led the ouster of elected president Mohamed Morsi amid massive street protests. Since Morsi's ouster, Egypt has been rocked by a growing militant insurgency that first concentrated in the border Sinai Peninsula but later spread to other cities. Militant fighters say they are avenging a state crackdown on Morsi's Islamist supporters which has killed hundreds and jailed thousands of others. Areas of cooperation will include providing UK training for Egyptian officers on human rights, the Egyptian spokesman said. 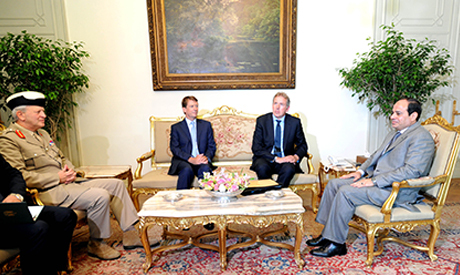 The talks were also attended by Defence Senior Adviser for the Middle East Lt Gen Simon Mayall and British ambassador in Cairo James Watt. On the economic front, Darrock affirmed the UK's support for Egypt in talks over a possible loan from the International Monetary Fund. Egypt and the IMF have discussed a $4.8 billion loan to help shore up an economy in tatters since the 2011 uprising that toppled president Hosni Mubarak. These talks took a backseat after the Gulf Arab states pledged over $12 billion in aid to Cairo following Morsi's overthrow last year. as Great Britain is always with the most valiant to battle against those that today one has to fight. However personally, without any link to whatever governments say, in Egypt's case for the moment I'd want to keep the new protest law whilst amending it in so far as constitutionally there should be a not overly high maximum punishment for transgression. Like I do hope that at the end not every soup will have to be eaten as hot as it was cooked, e.g. in the mass death sentence cases. Actually to my opinion there never was a doubt the verdicts were severe to get people to question their own and collective conduct whilst with time passing and all juridical phases run through the look-out would be a little different.